UCSD drops games against UC Santa Barbara, Air Force; snags comeback win in overtime against San Jose State and five-point victory against Santa Clara. The UCSD men’s water polo team traveled north this week for the Kap7 NorCal Tournament, hosted by Pepperdine and Loyola Marymount University. The Tritons ended the weekend with mixed results: After dropping an 8–12 loss to UC Santa Barbara, they returned to the pool against San Jose State and took a 14–12 overtime win to close Saturday’s play. Sunday’s games took a similar course: UCSD dropped a tough 5–10 loss against Air Force to open play, then dominated against Santa Clara University and took a decisive 13–8 victory. The Tritons now stand at 9–9 on the season. UCSD dropped the first game of the tourney against No. 6 UC Santa Barbara in a 12–8 decision. Senior utility Chase Cockerill slammed the first goal into the cage for the Tritons after only 40 seconds of play, but the Gauchos responded with four goals of their own to take command of the game. Cockerill was able to find the back of the cage one more time in the last nine seconds of the frame to cut the deficit to two. 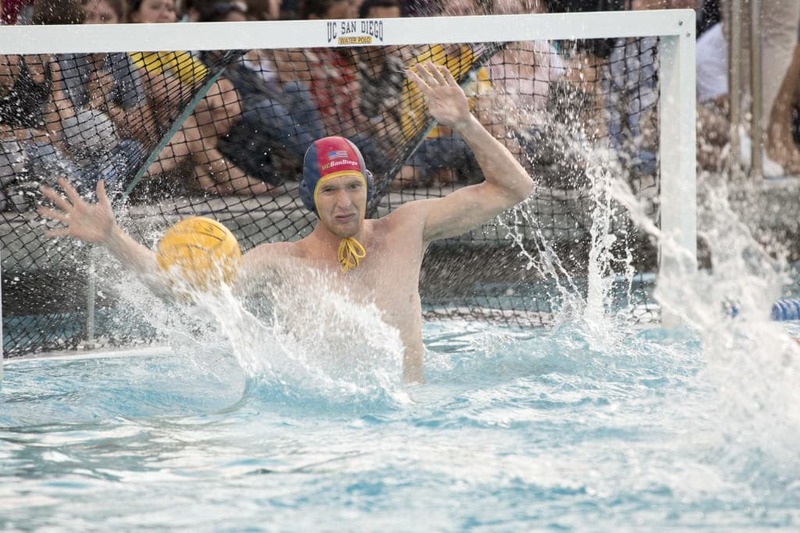 UCSB pushed their advantage to three early in the second quarter; however, junior utility Nassim Hmeidan was able to smash home a 5-meter penalty shot to narrow the gap back down. After one more Gaucho goal, Hmeidan scored again to close the period, keeping the margin at two in the third period. UCSB took two early in the quarter in an attempt to broaden their lead, but Cockerill and sophomore driver Cole Martinez both hit the target to close the gap again. The Tritons lost their hold in the final quarter, but UCSB outscored UCSD 4–2 to clinch the win and advance in the bracket. After a suspenseful four frames, UCSD outscored San Jose State 3–1 in overtime to snag a spectacular 14–12 victory. The teams sat even at 3–3 in the last minutes of the first quarter when freshman utility Kevin Asplund found the back of the cage on a 5-meter penalty shot with 53 seconds remaining, giving his team a one-point advantage. The Tritons then pulled to a 6–3 lead early in the second frame; however, the Spartans battled back to narrow their deficit back to one at the half. UCSD held a 10–7 advantage in the third, but San Jose State’s John Moon hit the target to close the quarter at 10–8. The Spartans then outscored the Tritons 3–1 in the last period of regulation to equalize and send the teams into overtime. Cockerill led the battle in overtime, scoring two goals to push his team ahead. Senior utility Jacob Castro added one more to set the score at 14–11. UCSD then dug in and held the San Jose State offense back, limiting the Spartans to just one goal with 1:17 remaining on the clock to claim the comeback win. Cockerill ended play with a game-high six goals. The Air Force Falcons outworked the Tritons in the consolation match and took a crushing 10–5 victory. In the first quarter alone, the Falcons hit the target three times and held UCSD scoreless. Air Force would score two more in the second before the Tritons were finally able to break through. Senior two-meter Tyler Mancuso found the back of the cage with four minutes remaining in the period, closing the half at a 5–1 disadvantage. The Tritons narrowed their deficit to three after junior driver Andy Moore scored at the 4:34 mark. Air Force responded with another goal to widen the gap, but UCSD’s Hmeidan fired home a goal of his own to set the score at 3–6. But the Falcons scored twice more to end the frame at a massive 3–8 advantage. They drove the knife home in the fourth, scoring two and limiting the Tritons to two to take the win and advance in the bracket. UCSD played to win from buzzer to buzzer in their final game of the tournament against Santa Clara, taking a 13–8 victory to close out Sunday’s play. The Broncos first scored off of a power play by Julian Fraser; however, the Tritons’ Martinez responded with a power play of his own to level the score at 1–1. UCSD proceeded to outscore Santa Clara by a 3–1 margin to snag a 4–2 lead at the end of the frame. The Tritons continued their run in the second, scoring four and limiting the Broncos to two to take a commanding four-point lead entering the half. They then dominated the pool again in the third period to increase their lead to five. Santa Clara battled back early in the fourth, though, with Fraser notching another power play in the first 30 seconds of the frame, then scoring again at the 3:57 mark to close the gap to three. UCSD hit the target once at 2:52 and again less than a minute later to steal the win and end the day on a high note. Cockerill led the Triton offense with four goals. Freshman goalkeeper Sam Thompson amassed 11 saves over the course of the game. UCSD will be back on the road this upcoming week when they go north to play Cal State Long Beach on Thursday, Oct. 15.